Pokemon Card Grading – Should You Get Yours Graded? Pirates Card of the Day – Over 800 Reviews! [Ultimate Stride] (Released when the number of face up cards in your G zone is three or more! When it returns to the G zone, remove your G zone! )-Stride Step-[Choose a card with the same card name as your vanguard from your hand, and discard it] Stride this card on your (VC) from face down. [AUTO]:[Counter Blast (2)] When this unit is placed on (VC), you may pay the cost. If you do, until end of turn, this unit gets drive-2, this unit does not [Rest] for attack, and it can attack up to three times during this turn. Ratings are based on a 1 to 5 scale. 1 is bad. 3 is average. 5 is great. The sound you can hear are the people sobbing their eyes out over this not being checked by Brillian Blister. Anyway, we have what is easily the most useful Zeroth Dragon of the lot so far. 3 vanguard attacks, all carrying the threat of a Critical Trigger, is a generally useful skill everywhere, and it’s assured hand destruction regardless of how poor your field looked before you played this. I still wouldn’t say a poor hand or field is very likely for the decks it’s for though: Zubat Viktor is a +2 every turn as long as you juggle resources correctly, Chaos always worked on a large hand, and new Gallop works just fine on its own anyway. Most useful in: Viktor, although Viktor probably won’t even need it, Chaos as a general finisher, and Grandgallop, since you can get Stark to 100k and make it Bravest Peak on crack, distilled into its most potent form. What’s up, Rogue Squad?! 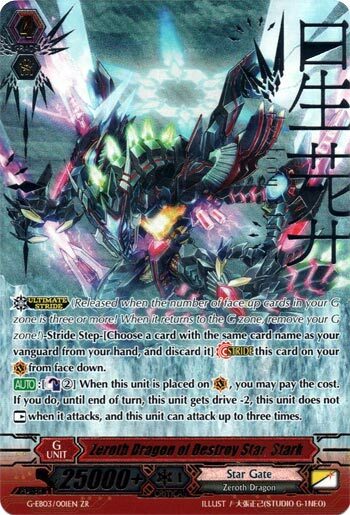 To wrap up this week, we get to look at the fourth Zeroth Dragon of the game, and arguably the best of the currently released Zeroth Dragons, Stark. As a Grandgallop player on the side, when I saw this card’s effects revealed, I started foaming at the mouth at just the thought of attacking at a minimum of 50k three times in a turn (new Gallop with his on Stride skill), and that’s not including any teeny tiny buffs you’d give this and topping it off with the Cosmic Hero G1 that doubles your Vanguard’s power to make this beast attack for easily over 100k…and did I mention that this is an attack they have to fend off three times? As far as other clans are concerned, Victor getting more attacks for cheap makes them even more obnoxious than they already are, and fin you want to mention obnoxious, then you can’t forget mentioning Link Joker and how they can block out your front line to help with whatever little extra shield value you’d need. If you’re playing anything from Star Gate, then you should try to make room for this beast. It’s definitely worth it. Next Time: More stars to gaze at. Go Rogue…Go Pro…and Fight the Meta!!! Visit the Cardfight Card of the Day Archive! Click here to read more CV Cards of the Day. The man in the chair! Feel free to contact me through the "Contact Us" link at the very top of the screen.